Basically, common nouns can be defined by providing the category label, the function of the item, and whatever additional salient details make the item distinguishable (e.g., the parts or what the item is made of.) This sounds easy enough, but let’s think about what is required for each step. 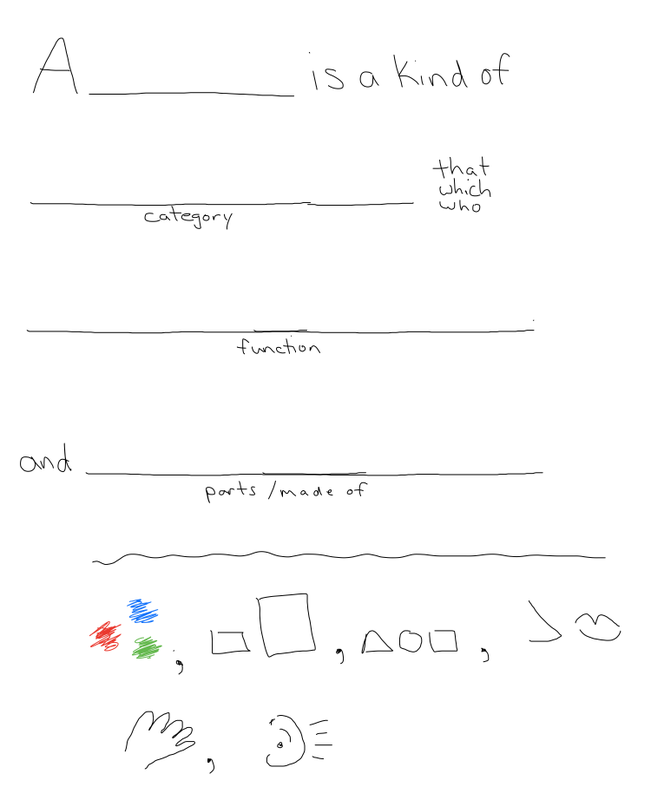 First, in order to retrieve the appropriate category label, one needs to have words stored categorically, for example, if I say, “sofa–what are some other things that are sort of kind of like it?” I would want to make sure the student has the ability to call to mind words or pictures like, “chair, table, bed,” that are also contained in the category. Secondly, it is from this framework that the category label is retrieved (or not, with many of our students with word-retrieval issues.) Once the student has gone through this “bottom-up” type thinking, they are then required to perform another complex task–that of comparing the item to be defined with all the other items contained in that category, so that important differences can be highlighted. The third step in the definition process for many common nouns is to identify the function. I might ask, “What does this do, or what do we do with it that makes it special and different from all the other items in that category?” So if the student says, “You sit on it”, I might challenge him with, “I can sit on a bench, a chair and a stool, can you be more specific? How many people might sit on it?” Once they formulate, for example, “A sofa is a kind of furniture that two or three people can sit on,” the fourth step would be to think about the component parts or what the item is made of. If additional information is needed (e.g., defining a lemon, an airplane, or perfume,) we focus on other salient details, such as size, shape, color, texture, smell, taste, sound, etc. Many times, so long as the category label, function and parts/made of information is provided, the word has been adequately defined.